Rod stračka (Delphinium) It belongs to the large family pryskyřníkovitých (buttercup), It comes from a number of other well-known and popular garden plants. It includes round 400 perennial and annual species of the region of origin in the Northern Hemisphere. Until recently here they were also ranked one year D. Ajaccio a D. consolidates, They are popular mainly for drying and to cut, Today, however, belongs to a separate genus larkspur (consolidates). The emergence of most of today's massed delphiniums garden participated in our domestic species Delphinium palatum, which is native to the mountains of Europe to Central Asia. Modrofalové to have blue flowers and grows up 2 m.
Another important species is D. grandiflorum from East Asia, who also stood at the creation of a number of varieties. As the name suggests, individual flowers of this species more, plants have strongly branched inflorescences and grow to a maximum height 1 m.
Also worth mentioning is red to orange-flowering varieties derived from species severamerického D. Papaver, which is also lower, grows only to a height of around 40 cm. Species and varieties are susceptible to waterlogging, especially in winter, where it is recommended to pour. The plant complies with sunny sites with lighter soil. intense red, that enrich the product range, It is very impressive, includes but in our conditions also less zimovzdorným and often last only one or two seasons. 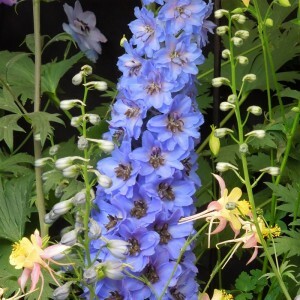 The gardens are grown mainly varieties under the collective name Delphinium × worshipers, are hyridního origin. In most cultivars greater proportion D. wave – This group includes higher, less branched varieties, We most common and popular. Leading position in plant breeding have for years maintained a European breeders, mainly from Germany and England. Regarding the conditions and demands on growing, They thrive best varieties of continental Europe, Most large-flowered varieties of English in our country grows poorly or gradually freezes. For several decades in the market well lead North American varieties from the Pacific-hybrids, which are available in a wide color spectrum and can be easily propagated by seed. Their disadvantage is, however, shorter life – under the terms withstand the furrows most 2 when 3 years. Individual varieties in addition to height and branching primarily distinguished fullness and flower color. Pink flowering varieties are rare and are generally somewhat less zimovzdorné and compared with the blue, purple and white flowering varieties also demanding. Another important group is lower Belladonna-hybrids with a share D. grandiflorum, which are popular for cutting and forcing even planting flower beds. Today reaching the market other, substantially lower varieties, derived from crosses with D. grandiflorum. Thanks stunted growth (maximally 50 cm) and strongly branched stems are mainly used for growing in pots and larger tanks, or on beds. Stračky se rozmnožují vegetativně i generativně. Until recently, with the exception of the original botanical species used almost exclusively vegetative propagation, which guarantees keeping all the characteristics of variety. Today the market is a sufficient number of varieties, after which the seed multiplication maintain good qualities and their stands are sufficiently balanced. When generative propagation is ideal sowing the seeds immediately after collection, possibly in early spring from December to March. For delphiniums it is also suitable conditions typical uneven germination, germination is high, almost 100 %. For this reason it is recommended to leave the seed trays longer after planted out young plants (Part nevyklíčených seeds sprout delayed). Seeds germinate in darkness massed delphiniums, sowings should therefore be covered. Most varieties from elatum and Belladonna reproduce vegetatively – division. The most appropriate term for the propagation of early spring (preferably from February to March, the latest in April). Nursery plants dig right, as weather permits, and after removing the old lignified parts are divided with the help of a sharp knife so, so that each plant had at least one eye and several roots. The cut surfaces often attack fungal diseases, Therefore, it is appropriate to their backfilling with crushed charcoal, possibly ashes. Most garden varieties of hybrid origin requires good humus soil is sufficiently supplied with nutrients, which are quite demanding. Higher are also moisture requirements. For planting is ideal sunny habitats protected from the wind, because in windy locations, especially when sufficient irrigation, their high and heavy stems frequently break or suffer from lodging. For this reason, in winter gradually freezes. Lodging flower stalks we ensure that planting at sites protected from the wind and mooring to the uprights. Flowers massed delphiniums are very well suited to cutting and drying. The most appropriate stage for a term cut, When the flowers are in the bottom third soukvětí and other blooming buds on stage. If you want to dry delphiniums, We cut is in full bloom and hang it in a well-ventilated room for several pieces upside down. Dry flowers require careful handling, because they are very fragile and easily fall off individual flowers. On the beds delphiniums very well combine with zápleváky (I Helenice), Turany (Erigeron), plamenkami (phlox), daylily (Hemerocallis) or velkokvětými daisies (Leucanthemum maximum). The article was published on the website of the Association Czech perenářů courtesy magazine Zahrádkář.